some of greater Cincinnati's most notable acts pay tribute to their favorite musicians & songwriters who have passed on. performers include: the BEAU BAND, One Week, Kyle English, for algernon, Ricky Nye, Mike Fair and the Adventure Seekers, House of Feeble Minds & Killer Star Effect! $6 gets you in. there will also be a raffle, along with some great prizes! 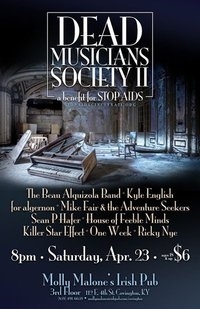 all proceeds benefit STOP AIDS Cincinnati.